*In just 4 week, 77% of women saw a significant reduction in the look of dark spots, discolouration, blotchiness and redness. Cutting-edge research reveals that night-time is when dark spots and other hyperpigmentation are exacerbated. By night, it starts working with our most intensive, comprehensive sintone correcting technology. By day, antioxidants help defend against the damage that can cause future dark spots. How to use: Apply on clean skin AM and PM before your Enlighten Correcting Creme. This product’s packaging is lovely – but then again I do love Estée Lauder products and always think that the packaging is great. The blue and gold combination is stunning. I think a pump bottle would have worked better for the serum, as I found more often than not I would dispense too much product at a time. The serum is silky smooth and glides onto the skin. It has a lovely scent. I had used the product for around 2 weeks and noticed that my skin tone improved (no more dull looking skin), and I was left with glowing skin. I also found that the slight scarring I had on my face was lightened – which made me feel that this product was a powerful serum if used consistently over a longer period of time. This product is also great at ensuring you are left with an even skin tone – I suffer from redness and this product was definitely a winner in banishing uneven skin tone. It is quite expensive, but definitely worth the splurge! 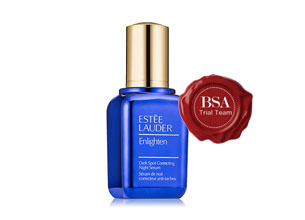 I have been using the Estee Lauder Dark Spot Correcting Night Serum for 2 weeks now. This serum has helped reduce the dullness and uneven skin tone I had. It has made my skin look and feel instantly fresh and hydrated. The application of these cream has been delightful. It smells gorgeous! My boyfriend was wondering if I was wearing perfume to bed the other day (all I could do was giggle like a little girl). I’m so happy with this product, as I feel I don’t need to wear foundation because I have nothing to hide any longer! I’d love to continue using this night cream because it not only works, but it smells and feels fantastic. I’d definitely recommend it to my friends and family. I was excited to receive the products as part of the Trial Team, as dark spots is exactly the problem I am trying to combat! Although I have only been using the product for the last 5 days, I have to say that there is a slight difference in the dark areas, particularly under the eyes. Unfortunately nobody else has noticed it, but I doubt I have been using it long enough for others to notice. What I like about the products is the fact that it is easily absorbed – something that is an absolute must for me when deciding on any beauty products. I still have about 2 days’ worth of products left, from the 5ml samples we were given, so it definitely looks like it can last – however I am not sure of the retail price, so can’t comment if it is “value for money” just yet.